Eversince I saw Ate Beng's post about the 'simple foods' that she prepared for Media Noche, I couldn't stop thinking about this dish - rellenong bangus [stuffed milk fish] that she made! It looked so yummy I could almost taste it. I think it's safe to say it's my ULTIMATE favorite especially the way my sister in law makes it. I don't know how to make it so I just wait until somebody makes it for me...LOL...and my sister in law always does...granted I'm around to eat it. Today, we finally had the chance to go to the Philippine store. Since we didn't plan in going anywehere else after shopping for my 'supplies' I thought I'd poke around the frozen stuff. 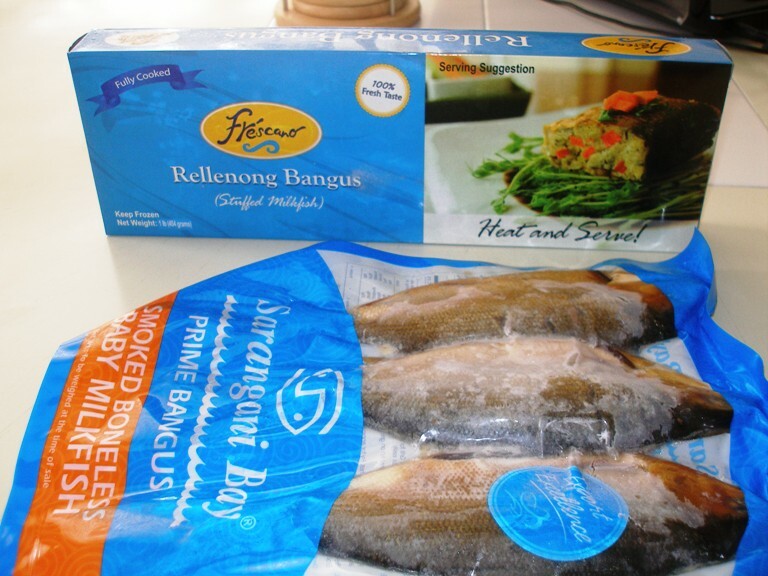 I normally don't buy frozen fish from there but I saw the 'smoked' baby milkfish [lower picture] and thought the hubby may want to try it...and he does so I decided to get a pack. Then I saw the 'Rellenong Bangus' [upper picture]. I hesitated for a while but went ahead and got one anyway. The lady owner of the store said they just delivered those and she hasn't had the chance to taste them herself and no one has bought any yet. That means I'll be the first one to give it a try. I'm just hoping it will taste okay...if only to satisfy that almost 10-year craving I have for 'Rellenong Bangus'. hay pagakain na naman hahaha.I've already tried this one but no, I won't spoil the excitement.try mo na lang ASAP. Wow naman, at special mention ang aking rellenong bangus! Maraming-maraming thank you Huling! Didn't know you also have that brand there. That's what I choose here when I look for frozen salmon. Pag salmon naman kasi dito, seldom maka-tiempo ng totoong fresh. Believe ako ha?! Napakain mo si M ng Pinoy food, at tinapa pa! Iba sya! I-try mo na nga agad ito Huling! Medyo alarming yata yung words ni J. he he.. Happy eating! Ingat sa tinik ng tinapa!